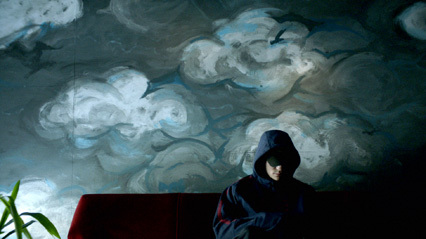 Beginning the second half of this spotlight on the World Cinema Documentary Competition: THE IMPOSTER, British director Bart Layton’s riveting and almost unbelievable story of identity, opportunity, and exploitation. Layton’s professional background is as a writer/producer/director of TV documentaries and series. Among the executive producers for the doc are Simon Chinn, who produced Oscar and Sundance award winner MAN ON WIRE (2008) and Sundance award winner PROJECT NIM (2011), as well as fellow 2012 title SEARCHING FOR SUGAR MAN; and John Battsek, producer of the Oscar winner ONE DAY IN SEPTEMBER, co-producer of Sundance alums LILA SAYS (2005) and IN PRISON MY WHOLE LIFE (2008), producer of Sundance alums SERGIO (2009) and THE TILLMAN STORY (2010), as well as executive producer on a number of other Sundance titles. As I’ve mentioned before on what (not) to doc, re-enactments/dramatizations usually stick out like a sore thumb in documentaries, bringing to mind hokey TV investigation series. Not so in Layton’s masterful film. He and his team have skillfully woven together stylized re-enactments with interviews to create something surprisingly cinematic, contributing to the absolutely gripping tenor of the doc’s remarkable story. Like films like THE SIXTH SENSE, this is the kind of story you feel compelled to rewatch, to pick up on new information offered in the improbable but ultimately logical twists presented during its course by its one-of-a-kind protagonist. At the same time, the audience may be left wondering if the film, like its subject, might not just be pulling one over on them as well… but if so, it’s completely fitting and enjoyable. The film doesn’t have a standalone website, but more information about it can be found on the production company’s page here. For screening dates and times at Sundance, click the link in the first paragraph. Thanks for your comment. I’m not sure why you are getting warnings – this site is on WordPress, and I haven’t heard of any such concerns about WordPress hosted sites before.